S5850-48S6Q is a high performance ToR/Leaf switch to meet the next generation Metro, Data Center and Enterprise network requirements. 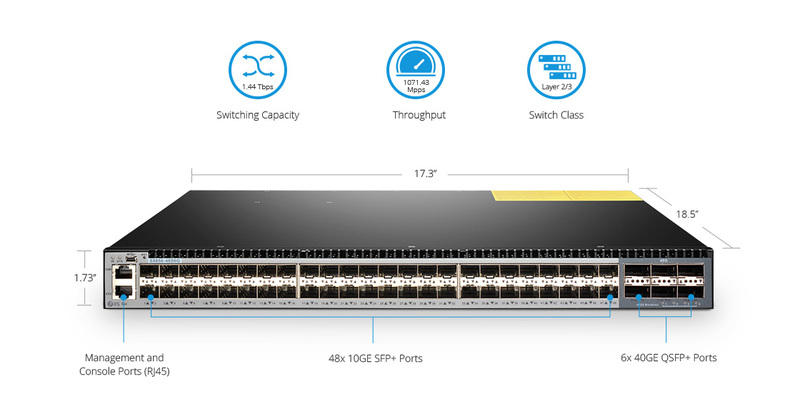 It has 48-port 10Gb SFP+ and 6-port 40Gb QSFP+ in a compact 1RU form factor and it's a low latency L2/L3 Ethernet switch. The S5850-48S6Q comes with the complete system software with comprehensive protocols and applications to facilitate the rapid service deployment and management for both traditional L2/L3 networks. With support for advanced features, including MLAG, VXLAN, IPv4/IPv6, SFLOW, SNMP etc, this switch is ideal for traditional or fully virtualized data center. The S5850-48S6Q is cost-effective Ethernet aggregation and core layer to Data Center application and is ideally designed for demanding workloads. FS has passed many quality system verification, like ISO9001, ETL, CE, FCC, established an internationally standardized quality assurance system and strictly implemented standardized management and control in the course of design, development, production, installation and service. This product fully accords with the ETL to indicate conformity with relevant industry standards for any electrical or mechanical product. Please contact us to learn more. • Support elephant flow detection. • Support ECN and PFC, etc. • Support static load balancing and dynamic load balancing. Vxlan/Nvgre inner header can paticipate in hash calculation. 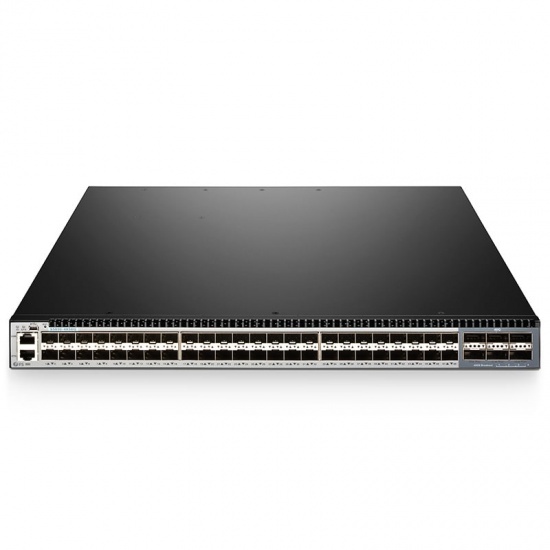 The S5850-48S6Q offers high-speed fully distributed architecture with 1.44 Tbps switching capacity for always on networking and provides robust security and QoS with advanced Layer 2 and Layer 3 features including support for BGP, OSPF, and VRF. The redundant hot-swappable power supplies and fans provide additional resiliency. It delivers high performance, operational efficiency, and design flexibility for traditional, virtualized, and cloud environments. Using the FSOS software platform, the S5850-48S6Q provides extensive data center service features and capabilities such as VxLAN, MLAG, VARP etc. S5850-48S6Q switch is valid for the IETF RFC2544 standard, which provides to evaluate the performance of network devices. The throughput test determines how well suited a device is to applications in which minimal frame loss is critical. We needed some data center switches for an urgently project. As our first vendor, FS.COM was always Surprising. Lots of switches were stocked in its US warehouse, we appreciated it. Since we had bought FS switches for several times, we placed an order with no hesitate. Now our project goes smoothly, thanks for your guys. I'm looking for some more price-friendly switch to replace DCS-7050QX-3. I know Fiberstore is always magic. While clicking around your website, it looks like S5850-48S6Q can meet my request.I know Fiberstore transceivers are very amazing but I never bought switch before. This is my fist time to purchase switch here.I have received the products today, but not installed it yet. I hope everything can go as my expected. Then, I can see if I may have another try on N8000-32Q to update our data center. To be honest, I am longing for upgrading my switch, but I can not find the right one until I find FS.COM. The price here is nice, and I can afford the optical switch as well as the fiber optics. It is based On IP Infusion ZebOS, also it can support the high-end function like VXLAN. This is the first time to cooperate with FS.COM. When I see the price about the switch, I was shocked with the low price. Now I have received the package and will use it in our own datacenter, hope everything goes smoothly. I bought two of S5850-32S2Q, and we need to set up LACP link between these switches and our current Hp switch, my sales helped me with the MLAG, which is really a good function I never tried, it's convenient to configure and manage these switches comparing than Staking. Now, these equipment are working well on our data center. Really thanks for your help for this new function! Encountered some problems in the purchase, but sales communicate with me patiently and check every product on my purchasing list for several times. I noticed the switch class and switching capacity of it, which can exactly meet our needs. And i tested it after received, running well in all aspects. I have to say, the service of FS.COM is gorgeous. My sales chose the fastest express for me, and I received all the products timely.thanks for all this! These switches work well on our data center for 1 month. FS do exactly what they promise, and they're always built to last. I'm looking forward to more cooperation. I met problem when installing this Switch, so I tried to ask for tech support. FS technicians are very professional. They helped me to make it work by remote controlling. What's more, I ordered some QSFP-SR4-40G optics for my Cisco swtich, I tried to test them on this S5850-48S6Q, they worked very well. Very satisfied with their products. Operates smoothly with my HP devices! I bought it to work with my HP Aruba equipment. what a big surprise, it operates smoothly with these devices and can be configured for different IP addressing scenarios with CoS/QoS policies! strongly recommend!! This model offers powerful function and only 1 U height. It saves my cabinet space.